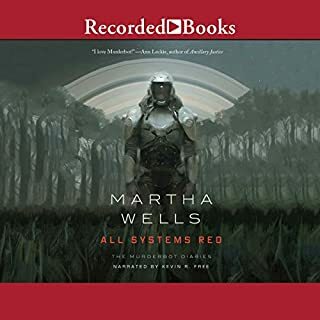 Great story, plot, and unique look at AI but all these books are so short they should be combined, like many of the other short books have been on audible. This feels like a giant rip off and so I won’t spend anymore credits on this. One of two books; first good second Star Wars clone. 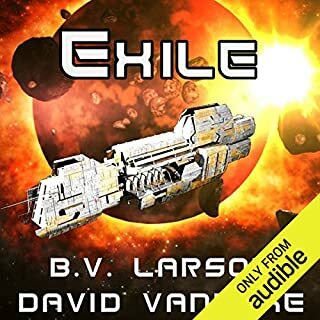 The first book was quite good, I’f not a copy of the undying legion series by BV Larson without the undying. Not sure what’s up w the. Second book is almost a carbon copy plot of Star Wars; evil intergalactic government, a princess,- bounty hunter, she’s even stored in a space ship compartment by a unruly gun slinger/smuggler. Note to self; don’t buy anymore audible exclusive books. Best way to fall asleep! Anyone who really loves falling to sleep easily, every single time they put it on. What was most disappointing about Olan Thorensen’s story? The entire boring plot. Sci-fi, I think not. More like a tail of the Middle Ages. 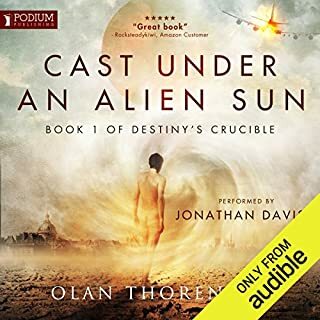 What character would you cut from Cast Under an Alien Sun? how the f**k did this get any good reviews? Best sci-fi I've read. Serious, funny, deep. This series made me laugh, upset, and triumphant. You can't ask for more. Amazing plot, voice acting, etc. I've listened to hundreds of books. This is in my top 3. 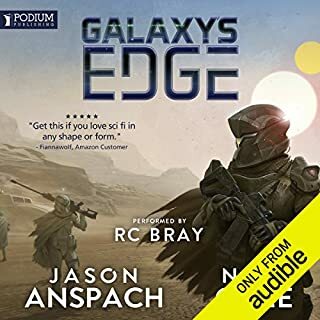 Lieutenant Jacob Mercer likes fast motorcycles, faster women, and screamin' space fighters. 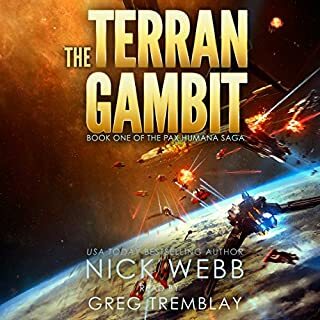 As a reckless fighter jock in the Resistance fleet battling the Corsican Empire, he lives solely for the thrill of taking out as many Imperial bogeys as he can. A rebel victory is looming on the horizon when the Imperials abruptly change tactics and, in a surprising show of devastating force, incinerate the city of Dallas with a thermonuclear blast - killing millions - and delivering a merciless example of what happens to upstart worlds.. So much trivial info so little happening. This book was a disaster. I let thinking it must get better something must happen. Things will be explained. The plot never happened, it's like he made it up as he was writing it. Piloted by a six-year-old girl, the godlike Skalm guards the Districts of TASC. Her family is long dead. Her adopted father is a synthetic copy of an alien, her nanny an artificial mind connected via subspace to every part of the globe, feeding the young girl information, finding prey to satiate her growing thirst. But the young girl is an innocent, a victim, one of millions the war has already claimed. An OK end to an otherwise great trilogy. Instant classic. Top 3 I've ever heard. 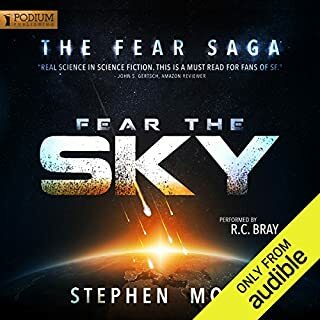 What made the experience of listening to Fear the Sky the most enjoyable? Everything, the ever twisting plot, the narrator, the characters. This is going to go down as one of the best sci fi books of all time. Epic believable characters, villains and hero's alike. Which character – as performed by R.C. Bray – was your favorite? Also too hard to choose. 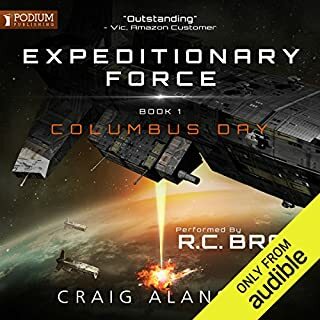 After almost a century of peaceful exploration and colonization of space, the United Earth Space Force stumbles across a shockingly xenophobic alien race that has more and better armed ships and refuses all attempts at contact. 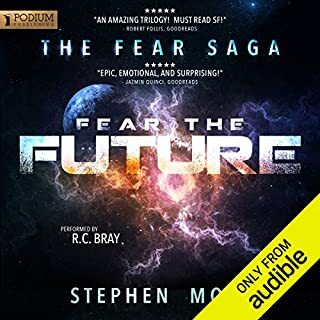 As the outgunned Space Force is driven back in battle after battle in what appears to be a war of extermination, one officer experiences precognitive visions that help him blunt the enemy onslaught, but he can't control or predict when they occur. So slow and trivial, endless meaningless fluff. Author focused too much on trivial details and not on the story and hand, interesting scenarios would blow by without much explanation and military meetings would draw on for chapters. 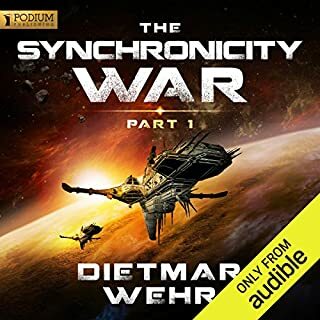 Has The Synchronicity War, Part 1 turned you off from other books in this genre? What does Luke Daniels bring to the story that you wouldn’t experience if you just read the book? If you could play editor, what scene or scenes would you have cut from The Synchronicity War, Part 1? All the meetings from the admiral with his staff and council people. The political blather is so boring. Can't put BV'S books down, including this one.